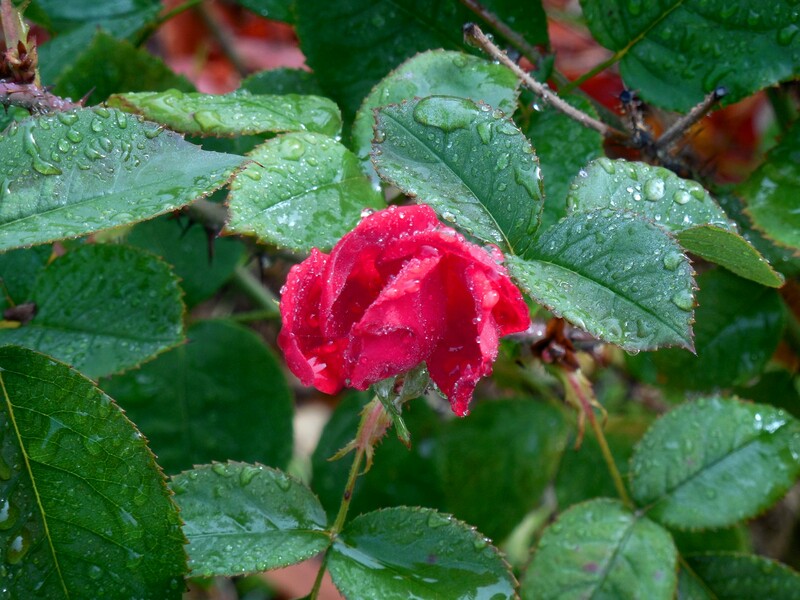 The 1/4 inch of rain was beautiful, much-needed and much-appreciated. 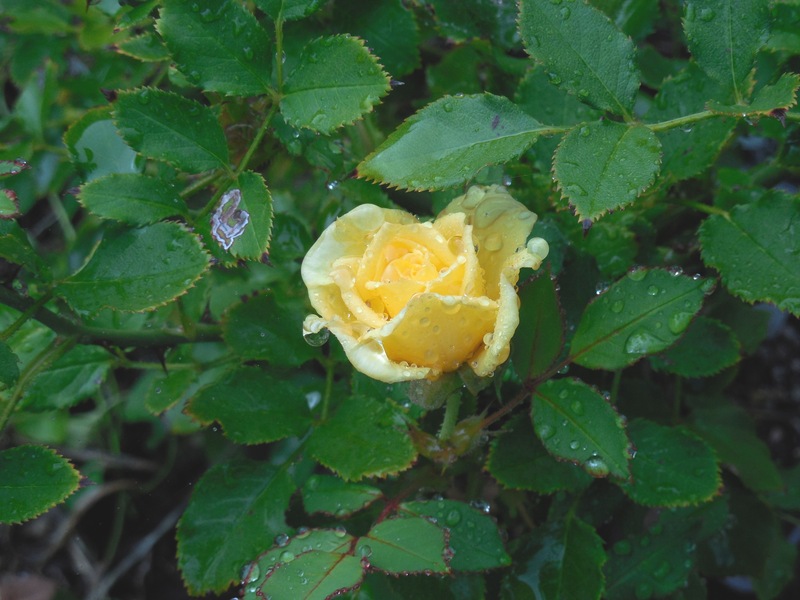 When I thought the flower garden was done for the year, what a nice surprise to see roses. It is almost Halloween – pretty late in the season for here. Categories: Uncategorized | Tags: Halloween, miniature, red, rose, roses mother nature, single, yellow | Permalink. 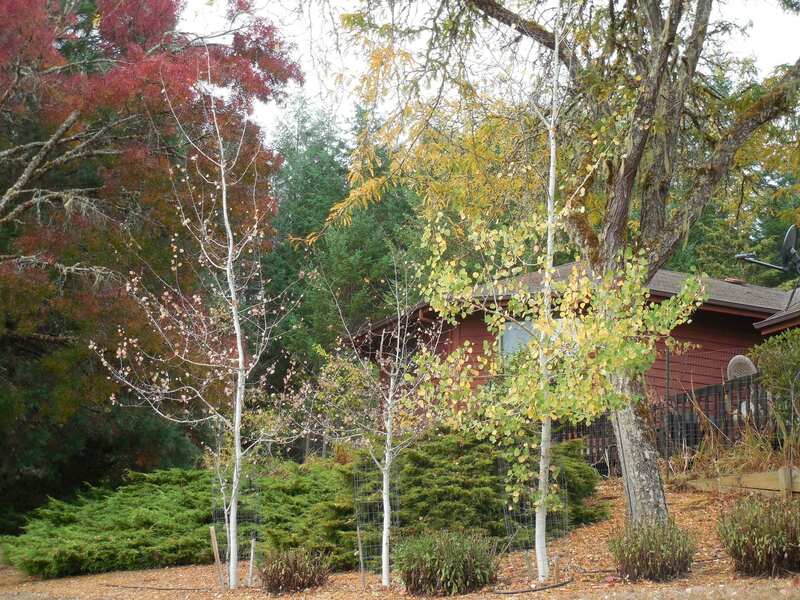 Leaves on the Sweet Gum tree (above left) are just turning from green to yellow, while the Sugar Maple (on the right) has lost most of its leaves. Why would the leaves on one of three Aspen trees still be hanging on, when the other two trees are almost naked? There are no flowers around the house. Between the drought and global warming, I should be able to find some plant that will flower later in the season. Driving today, I did spot nasturtiums in a neighbor’s yard. 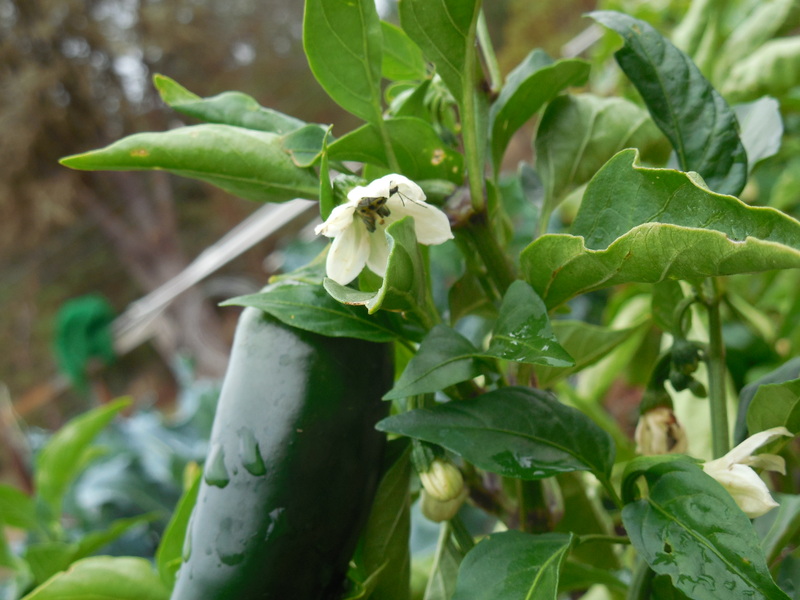 Those I know I can grow – and they come with the bonus attribute of being edible besides pretty and late-growing. Down in the garden, it is another story. 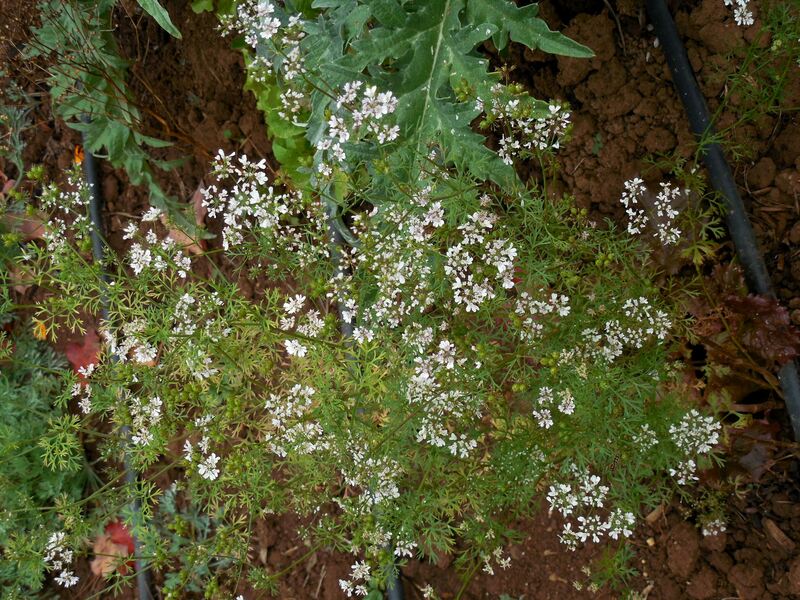 Dill (left) and Cilantro (right) flowers are staying handsome. I think it is the perfect balance between enough sun to keep them happy, but cooler days of less daylight keep both of these plants from ‘going to seed’. 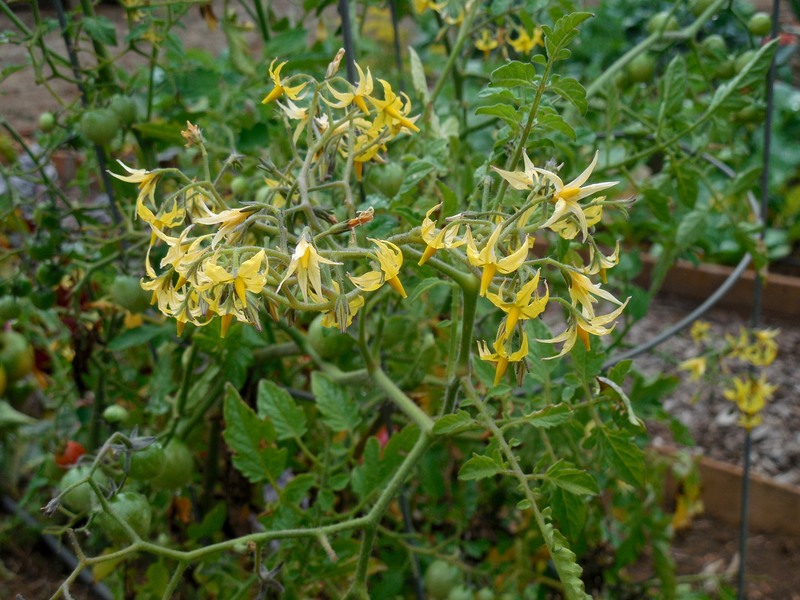 Cherry tomato and jalapeno flowers are in for disappointment, there is no chance they will grow to maturity before winter sets in. Just not enough heat-hours left in this season. Strawberries, also, keep blooming, and their fruit is much quicker to ripen, so I have a chance to harvest more of them – hoorah! Categories: Uncategorized | Tags: aspen, bi-color, cherry, cilantro, dill, drought, flowers, fruit, global warming, go to seed, jalapeno, leaves, maple, nasturtium, strawberries, sugar, sweet gum, tomato, tree, winter | Permalink. 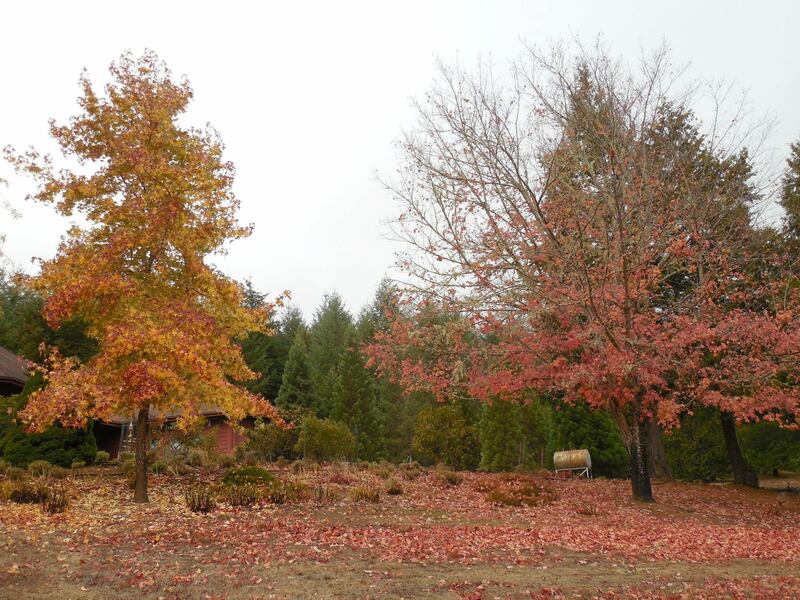 Some of these Sugar Maple leaves have been moved to cover beds in the vegetable garden for the winter. Today’s agenda includes: to finish moving this pile before expected rain comes tomorrow (unless I get side-tracked. . .). You can see there are plenty more leaves to come! We enjoyed a long hot summer. Grew delicious melons that rarely mature in the hills where I live – farmers really are gamblers! Our lack of rain has been sorely felt by the trees. 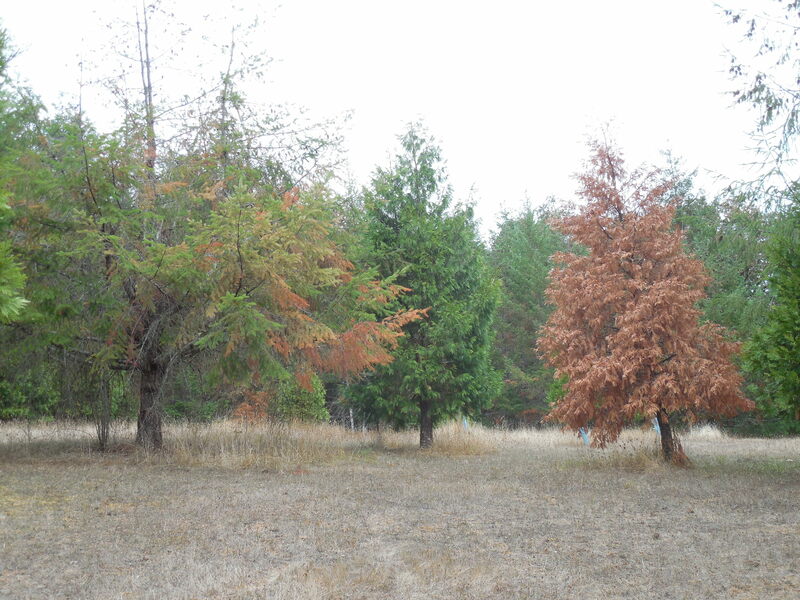 On the right, above, is a dead cedar tree just next to a thriving one. To the left is a fir tree slowly dying. There are too many more like these. To me, the saddest part is the quantity of very large (over 40 years old) fir trees that are dead and dying. 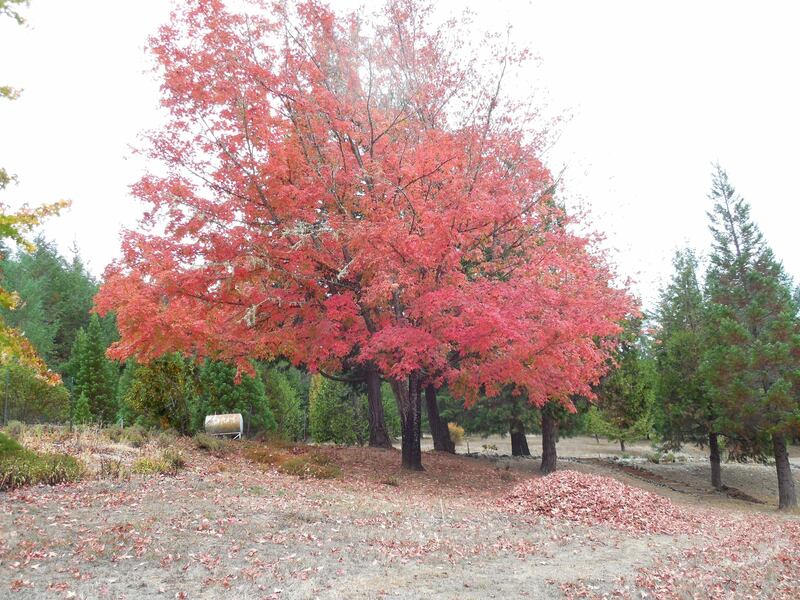 We will have to pay an accomplished tree faller to cut the dead ones without hurting live trees nearby. 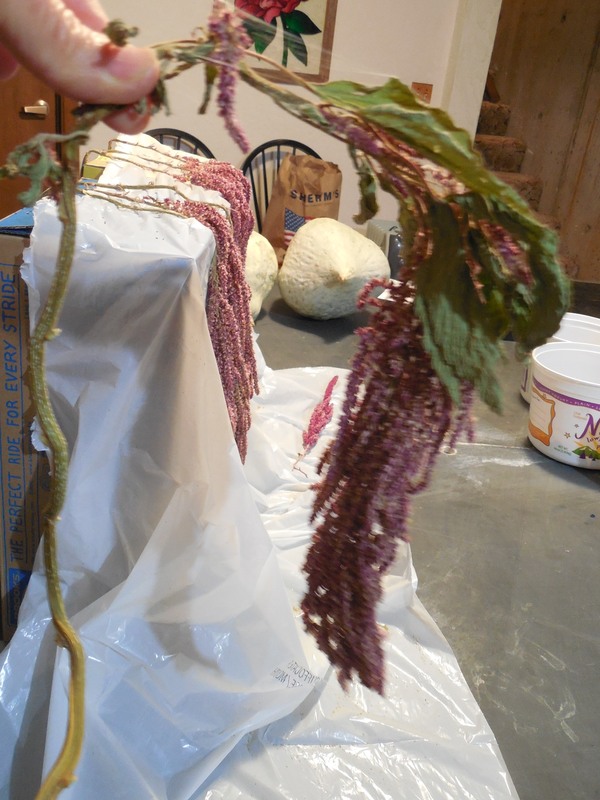 On a lighter note, I learned something about drying amaranth flowers. What was I thinking when I lay the fresh flowers in this position to dry? As you can see, they stay in the same position after drying! 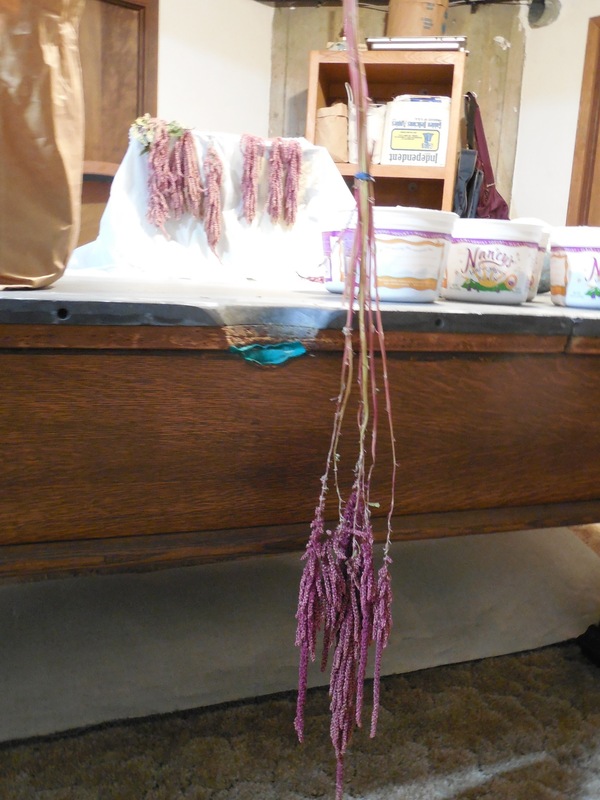 This drying position should give flowers that will display much nicer! Categories: Uncategorized | Tags: amarinth, beds, cedar, cover, dead, drought, drying, dying, fir, flowers, gamblers, leaves, melons, pile, sugar maple, tree faller, trees | Permalink. I found this post in my “Drafts” folder dated August 30, 2015. It was meant to be published then. 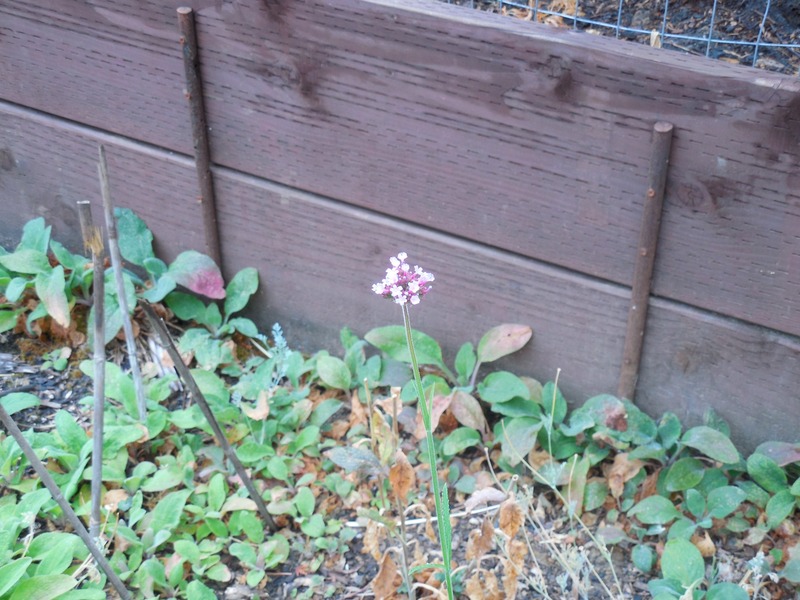 The flower is still in the garden over a month later. Even though the fields are brown and dry, deer have not eaten it. It is exciting to me, as a gardener, when a plant I was sure died over the winter, shows up in bloom later in summer. 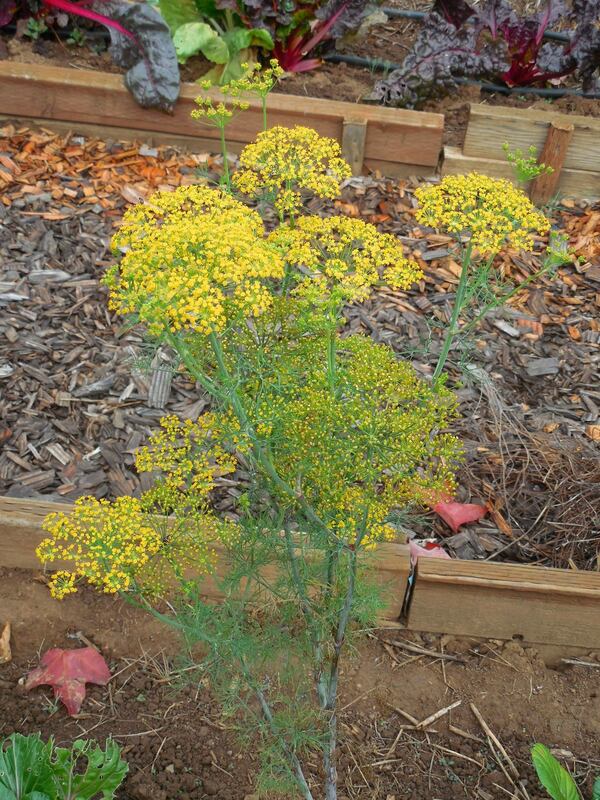 I am sure glad I did not mistake this emerging plant for an unwanted weed. The teeny-tiny, one inch (2.5 cm) flower of verbena bonariensis, might be easy to miss, even though its stem is almost 3 feet (one meter) tall. When this plant was purchased, I was sure it was a perennial. Not exactly. It can return, but my winters are too cold (unless global warming keeps the mild winters around) for the plant to stay put. It comes back by reseeding. Wind and birds determine just where it will show up. In fact, it can be invasive (that is a very nasty word for gardeners). In my little corner of land, I am not concerned about it taking over, as it is barely surviving. I wouldn’t mind seeing a small patch of these cute purple blossoms in my flower bed. 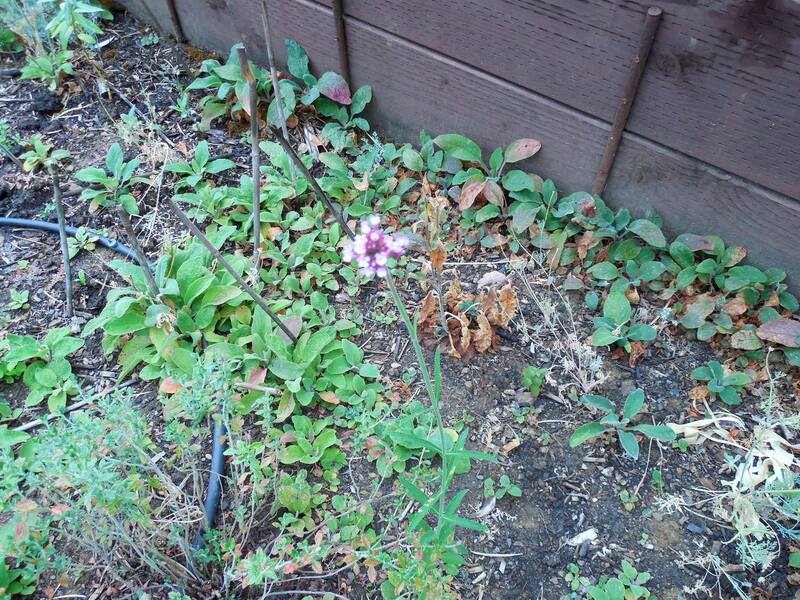 Categories: Uncategorized | Tags: bonariensis, flower, global warming, invasive, plant, purple, reseed, teeny, tiny, verbena | Permalink.